Don't worry we are developing a bar for your truck too. Own a 2017-18 F250, F350? Click here for the install instructions. The Trac-inator is a direct bolt on trac-bar designed to terminate the effects of deflection, increase steering response and control. Our design incorporates a 1" uniball set inside a custom cup assembly that (like the stock balljoint) is pressed into the original stock axle location. Our uniball setup allows the use of a double shear bar mount without having to move the pivot from it's stock location. At the frame mount we use a 1" hiem, instead of rubber or polyurethane bushing. The bar itself is 1-5/8 OD x 1/4 thick DOM tube and the plating at the axle mount equates to a 7/16" thickness per each bolt tab. All of this adds up to the best bar you can buy to neutralize the causes of "Death Wobble". Note: Bars purchased before 2016 used the JMX16t-1 hiem size. “Bar works great! Drives like it should no bump steer and feels safer to drive!” Robert V.
“After lifting my new F250 I was always unhappy with the steering feel, the wife would not drive it. After installing Baja Customs trac-bar, Dynatrac balljoints, and HD tie rod ends all issues were fixed. Truck steers much, much better than when new, wife agrees. I was considering dumping the truck at a great loss, now very happy. This is my daily driver and serious offroad toy.” Paul G.
“The tracinator is awesome, tightened up the front end so my F350 handles like a go cart, thanks again for the fix.” Basil H.
“Perfect fit, great craftsmanship, by far the best product out there trac-bar wise.” Brian M.
The OEM trac-bar or pan-hard bar setup, is a bar mounted in single shear to a ball joint at the axle and a rubber bushing at the frame. The OEM bar is offset from the center of the ball joint at the axle. 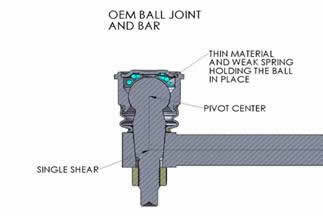 This applies un-wanted torque and deflection on the joint and the rod. The rubber bushings at the frame mount is another source of un-wanted deflection. As the balljoint and rubber bushings wear, deflection increases. When deflection occurs the trac bar loses its ability to keep the axle in position laterally under the truck. The wobble or shimmy you feel from the steering wheel is actually the steering linkage being forced to control the axle and wheels, as the trac bar deflects. Note: In regards to certain replacement bars on the market that relocate the axle trac-bar mount higher. Be aware the only scenario where this would be acceptable is if a lift kit was installed without or did not include a drop down bracket for the trac-bar. Considering most lift kits provide a drop bracket, moving the axle mount position higher would only worsen the suspension geometry. Baja Customs provides a Limited Lifetime Warranty to the original retail purchaser who owns the vehicle, on which the product was originally installed, for defects in workmanship and materials (exclusions apply, see below). The Limited Lifetime Warranty excludes the following items, hiem joints, uniballs, and delrin isolators. These parts are subject to wear and are not considered defective when worn. Notwithstanding, Baja Customs may offer free replacement for parts subject to wear with sufficient evidence of premature part failure. Baja Customs does not warrant any product for finish, alterations, modifications and/or installation contrary to Baja Custom's instructions. Alterations to the finish of the parts including but not limited to painting, powder coating, plating and/or welding will void all warranties. Some finish damage may occur to parts during shipping, which is considered normal and is not covered under warranty. This product is not designed nor intended to be installed on vehicles used in race applications or for racing purposes or for similar activities. (A "RACE" is defined as any contest between two or more vehicles, or any contest of one or more vehicle against the clock, whether or not such contest is for a prize). This warranty does not include coverage for police or taxi vehicles, race vehicles, or vehicles used for government or commercial purposes. Also excluded from this warranty are sales outside of the United States of America. Baja Custom’s obligation under this warranty is limited to the repair or replacement, at Baja Customs option, of the defective product only. All costs of removal, installation or re-installation, freight charges, incidental or consequential damages are expressly excluded from this warranty. Baja Customs is not responsible for damages and/or warranty of other vehicle parts related or non related to the installed Baja Customs product. This warranty is expressly in lieu of all other warranties expressed or implied. This warranty shall not apply to any product that has been subject to accident, negligence, alteration, abuse or misuse as determined by Baja Customs. Baja Customs reserves the right to super cede, discontinue, change the design, finish, part number and/or application of parts when deemed necessary without written notice. Baja Customs is not responsible for misprints or typographical errors within the website or price sheet. NO LIABILITY FOR DAMAGES. TO THE MAXIMUM EXTENT PERMITTED BY APPLICABLE LAW, IN NO EVENT SHALL THE COMPANY OR ITS SUPPLIERS BE LIABLE FOR ANY DAMAGES WHATSOEVER (INCLUDING WITHOUT LIMITATION, SPECIAL, INCIDENTAL, CONSEQUENTIAL, OR INDIRECT DAMAGES FOR PERSONAL INJURY, LOSS OF BUSINESS PROFITS, BUSINESS INTERRUPTION, LOSS OF BUSINESS INFORMATION, OR ANY OTHER PECUNIARY LOSS) ARISING OUT OF THE USE OF OR INABILITY TO USE THIS PRODUCT, EVEN IF THE COMPANY HAS BEEN ADVISED OF THE POSSIBILITY OF SUCH DAMAGES. IN ANY CASE, THE COMPANY’S AND ITS SUPPLIERS’ ENTIRE LIABILITY UNDER ANY PROVISION OF THIS AGREEMENT SHALL BE LIMITED TO THE AMOUNT ACTUALLY PAID BY YOU FOR THE PRODUCT. BECAUSE SOME JURISDICTIONS DO NOT ALLOW THE EXCLUSION OR LIMITATION OF LIABILITY FOR CONSEQUENTIAL OR INCIDENTAL DAMAGES, THE ABOVE LIMITATION MAY NOT APPLY TO YOU.